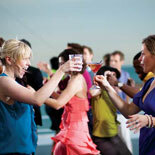 High-energy fun for everyone, with dining, dancing, sightseeing and entertainment all rolled into one cruise experience. 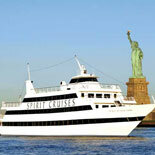 The Spirit of New York Lunch Cruise is an unforgettable experience and the most unique way to celebrate an afternoon! 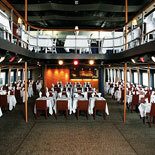 Come Aboard the Spirit and enjoy the most entertaining lunch experience on either side of the Hudson River! This two-hour cruise on New York's historic harbor is perfect for an afternoon getaway, a birthday, office party, entertaining out-of-town guests or touring New York. One price includes a festive Bon Voyage with streamers and a toast, Cabaret-style table seating, Grande Buffet dining, accompanied by subtle background music along with a narrated sightseeing tour of Manhattan's Skyline. While you dine, you'll enjoy a fascinating narrated tour of your city's most spectacular sights, seen from our hugh panoramic windows. Throughout the cruise our DJs will create the perfect vibe. Statue of Liberty, one of the most celebrated landmarks in the world! The three-deck, 600-passenger Spirit of New York spaciously designed with climate-controlled interior decks, outdoor strolling decks at the bow and stern, and the largest outdoor patio decks on New York Harbor. 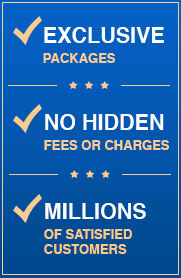 Amenities include full service bars, dance floors and huge, panoramic windows. 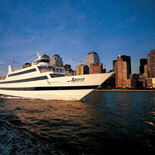 Recently remodeled, the three-deck Spirit of New York has a chic and cosmopolitan look with many features. Seeing is Believing! Catch the Spirit! Make your reservation today for the most exciting two-hour afternoon adventure in Manhattan's Harbor. Don't miss the boat for possibly the most memorable lunch you'll ever experience! 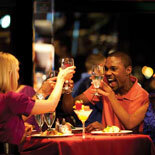 Come Aboard the Spirit of New York Lunch Cruise where amazing sights, fun and memories await! Daily ^ Board 11:30 am. ^ Cruise Noon to 2:00 pm. Please check available dates with the calendar on the Reservations Page. Boarding and departure times are subject to change. Please call or email Spirit of New York to reconfirm departure times. E-Ticket will have details. West 23rd and FDR Ave.
All cruises sail rain or shine all year long. Wheelchair accessible. Appropriate attire is casual business. Photo ID required to pick up tickets. Seating is flexible. 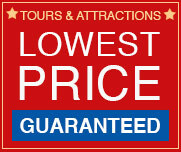 Guarantee Note: Due to the limited reserved seating and factors beyond the control of the operator, this product does not fall under the Trusted Tours and Attractions Guarantee program.